Suet is a popular food for many backyard birds, and it is excellent to offer birds year-round. Understanding the different types of suet available is the first step toward feeding birds this nutritious and appealing treat. Balls: Similar to the density of cakes, but spherical to be used in large cages or nets either singly or in a group. Plugs: Designed for log-style feeders for a more natural feeding surface for woodpeckers or clinging birds. Pellets: Small, bite-size pieces of suet in a shape similar to large seeds or nuts, ideal for tray feeders or dishes. Crumbles: Bite-sized suet pieces in a softer blend for birds to nibble from trays, platforms or dishes. Shreds: Very small, thin pieces that mimic the size and consistency of worms or insects and are offered in trays or dishes. Novelty suet shapes are also popular, particularly for holiday gifts. Suet cakes shaped as hearts, wreaths, stockings, pine trees, bells, shamrocks, and other shapes can be found at different times of the year. Softer types of suet may be sold as “butter” or “dough” blends and while they won't fit firmly in a feeder, they are ideal for spreading on trees, boards or posts for clinging birds to sample. Fruit: These cakes are flavored with cherry, blueberry, raisin, apple, orange, blueberry, pomegranate or other fruit flavorings. Small bits of dried fruit are typically included in the mix. 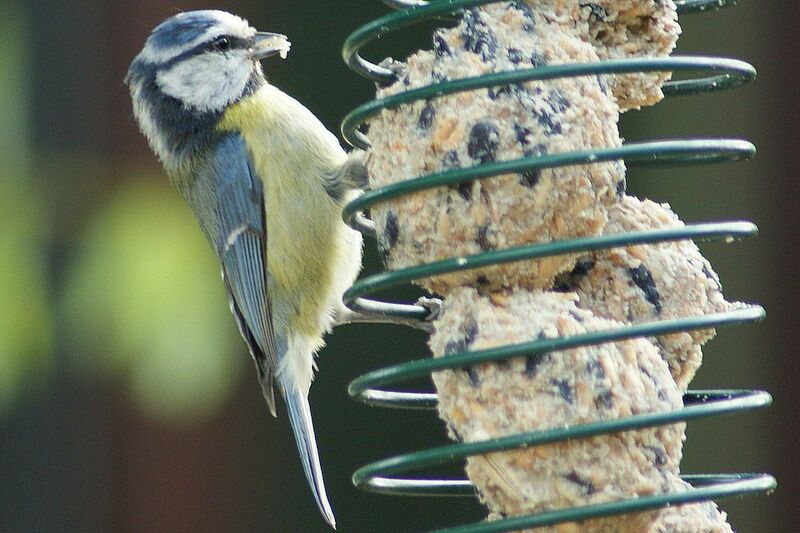 Insect: Dried flies, crickets or mealworms give this suet blend a crunchy appeal popular with insect-eating birds. Seeds: Seed-mixed suets are some of the most popular types and include black oil sunflower seed, millet, cracked corn and safflower seed added into the cake. Nuts: Nut-loving birds will appreciate suet blends with peanut flavoring or with whole nuts and nut pieces mixed in, including not only peanuts but also almonds, pecans, walnuts, and other tidbits. Pepper: Hot pepper suet cakes are formulated to resist feeder pests with sensitive taste buds, such as squirrels and raccoons. These cakes include red pepper flakes, powder or flavoring to add heat to the blend, but birds have a very weak sense of taste and are not bothered by the additions. In addition to these straight flavor offerings, flavor blends such as fruit-and-nut are also popular choices, particularly when many different types of birds may sample the same suet cake. Some blends are specially designed with certain birds' tastes in mind, such as woodpecker blends (fruit, peanut, and nuts), bluebird blends (insect suet) and songbird blends (fruit and seed). Many suet cake shapes and flavors are available in “no-melt” blends that birders may prefer in the summer. While any suet cake will soften and melt somewhat in the hottest weather, these specialized blends have extra mix-ins such as flour or grain meal to slightly lower the fat content so the cake can keep its shape in higher temperatures. No-melt suet blends are available in many of the same flavors and shapes found for regular suet. Selecting flavors to suit specific birds' preferences, such as nut blends for woodpeckers, orange flavors for Orioles or seed blends for songbirds. Opt for different shapes that fit birds' feeding styles. Hanging balls or cakes appeal to clinging birds like chickadees, woodpeckers, and nuthatches, while shreds or crumbles are best for other birds like thrushes or bluebirds. Change suet feeders to discover which styles your backyard birds prefer. To keep from wasting suet until the birds are eating it regularly, cut cakes into pieces and store the excess in the freezer.